Better known as a composer of church and organ music, Sowerby left quite a lot of orchestral music, including five symphonies. His music is identified by the work list compiled by Huntington. The music presented here has some affinity with that of other American composers of the same era such as Howard Hanson, although with a slightly harder edge, so you will hear the odd phrase which will remind you of Hindemith and, at one point, Mahler's 5th. The slow movement of the symphony would have made an excellent complement to one of John Ford's movies set in Monument Valley, and I mean that as a compliment. 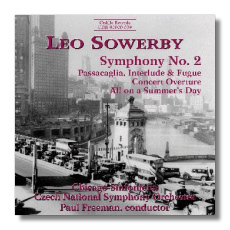 Cedille has recorded another CD of Sowerby's orchestral music, including The Prairie.